My travels this weekend were borne out of a desire to attend the annual European Coaster Club event at Oakwood Theme Park, something that I've been meaning to do for several years. Though it was slightly cheaper to fly I decided it'd be more comfortable to take the ferry, giving me the option to visit a few more parks en route. The first of these was Greenwood Forest Park, located less than half an hour from Holyhead Port. Satnav had the park in exactly the right location, which was probably just as well; I'm not sure that I'd have found it otherwise. The target market for this park is clearly children, as can be seen from the web site which features a whole subsection labelled information for grown-ups. Be that as it may, anyone with a passing interest in amusement ride technology will be fascinated by the place, thanks to its unique roller coaster. 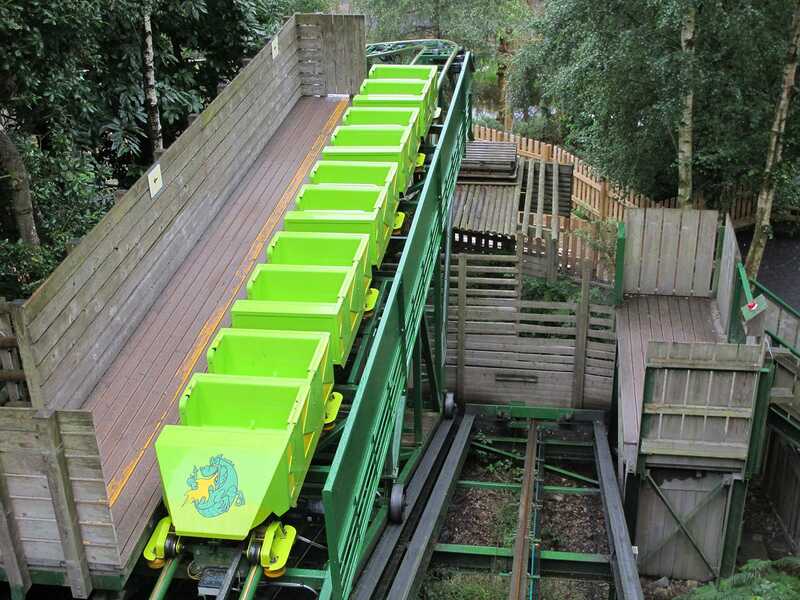 The Green Dragon (#1553) eschews the usual lift hill in favour of a small funicular railway which raises the train to the top point of the ride using a train load of passengers as a counterbalance, theoretically allowing energy neutral operation. Once the train is in position passengers climb up some stairs to board. I'm not sure how energy neutral this really is on quieter days when the train isn't full, but it's nevertheless a seriously neat concept. Better yet, the coaster itself is a winner. The layout is a terrain hugging design, that can be thought of as a junior version of the legendary Lisebergbanan. The length was a little shorter than I'd have liked, but that really is a nitpick; all it really did was encourage me to ride more than once. I recently came across a magazine article which suggested that visiting amusement parks helped with weight loss thanks to people walking around all day. Climbing the hill for this ride probably qualifies as an extreme workout, but one which I'd have no problem repeating on a regular basis. Powered coasters don't generally interest me, but when I realised that my route passed within a mile of one I elected to use it as a break from my driving. Little did I realise what I'd be walking into. 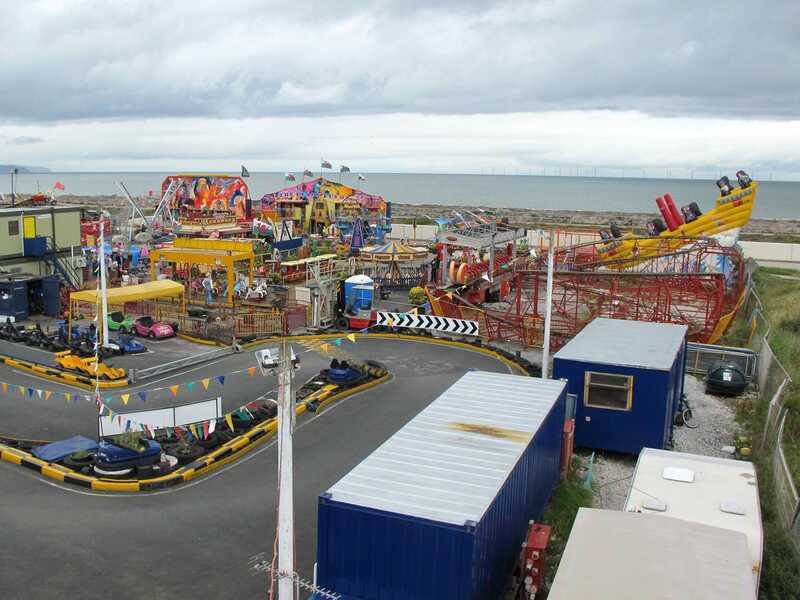 The area around Knightly's Funfair can be summarised by the signs everywhere warning about various things; from the £500 fine for drinking alcohol in the street, to the restaurants open to couples and families only. The general smell of fast food could be thought of as aiding gentrification. It took me ten minutes to ride the Twin Dragon Spiral Coaster, and with that out of the way I made a rapid exit. Stop three was at Camelot Theme Park, where I renewed my acquaintance with an old friend from Japan. Knightmare consists of the ride track and trains from the classic BMR-X, albeit without the mountain facade that adorned the old ride. The result is more than a little ugly, and worse yet the move has introduced some fairly nasty bumps in the track that didn't exist originally. While I'm all for the preservation of classic rides, it should be done properly, which in this case hasn't happened; Knightmare is still a decent ride, but it is no longer a top ten attraction. On my way towards the exit I caught a quick spin on Whirlwind. Brean Leisure Park was a lengthy diversion for me today and it honestly made no sense to visit at all. Nevertheless, I decided to make the drive on the grounds that it was home to the only remaining adult coaster in the entire United Kingdom that I'd yet to ride. It was rather tempting to make a ch-ching noise as the wheels started turning on the Magic Mouse (#1554), but somehow I managed to resist.